I am definitely loving this anime so far. I promised myself that I wouldn't do any background research on it and leave everything a surprise, but so far so good. I will write a better review after I watch the next 2-3 episodes. Very promising beginning. The art is beautiful - sharp, clean, and characters; generally attractive. The anime begins with the enigmatic Hyobu Kyosuke bringing into his organization Andy Ninomiya (who was working to infiltrate said organization, P.A.N.D.R.A. ), for unknown reasons ("you could be fun to tease and harass when I'm bored"), and follows his organizations exploits. It's the law vs. P.A.N.D.R.A, and the viewer isn't sure which side is "good" and which "bad". 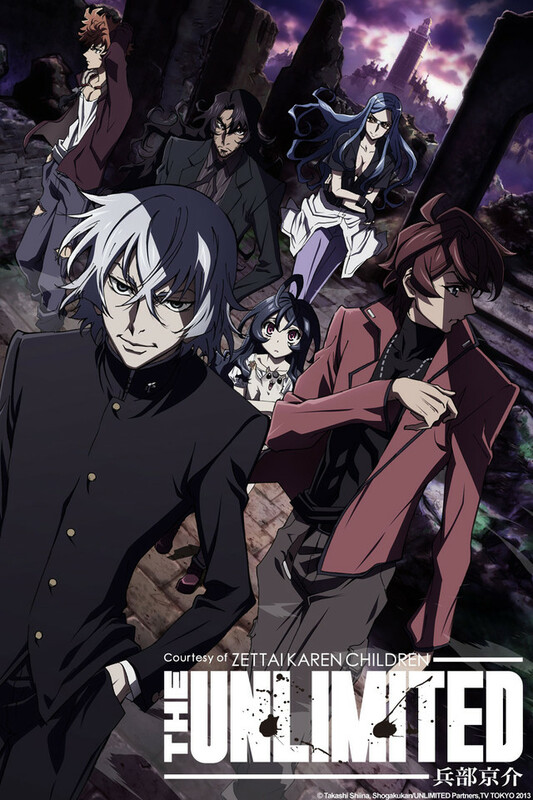 I've never heard of Zettai Karen Children, but that hasn't stopped me from getting emotionally invested in this anime. Andy is certain that he's on a terrorist's ship, but he sees how they take in and provide a home to children, and those who are unwanted, because of their Esper abilities. However, he also sees the damage inflicted by P.A.N.D.R.A. on those who oppose them - damage they can inflict because of their Esper abilities. So far the characters have truely captivated me and have really drawn my interest. I am 2 episodes in and so far I have nothing to complain about. 2 episodes in and the plot thickens in episode 1 I cant wait to see what happends and were it goes. Did not expect such an anime at the start of the year, brings you in straight away at the beginning of the first episode with heaps of action and a cliffhanger at the end! All hopes that this anime continues to intrigue in further episodes!! No seriously stop STOP. CLICK ON THE FIRST EPISODE. YOU WILL NOT REGRET IT. dudes, i love animes with action and guys. But dudes...this anime the action, the storyline, and just the intensity. IT IS JUST EPIC. Like, even if you were looking for a love story, i promise you this will like be so much better. I can't really explain how awesome this is, until you watch it. They all have really sick powers. If you doubt my words, WATCH IT. AND THEN JUDGE. go on, i command you to watch this anime. I was a little hesitant to start this one as it mentions in the description that it is a spin off of an anime that I have not yet seen and doesn't seem to be on CR. I started watching it anyway and how can you go wrong when it starts with a guy blowing things up? So far it does not appear that you would need to have watched the other anime prior to this one. The plot seems really good and I like how it focuses on the antagonist. It also seems to me that this has a very X-men feel to it. So far this is an enjoyable show and I would reccomend it. most epic anime i've ever watched. first episode with heaps of action and a cliffhanger at the end!. I am definitely loving this anime so far. I promised myself that I wouldn't do any background research on it and leave everything a surprise, but so far so good. Great art, Great Characters, Great story line. I'm not a manga reader,but I was sort of interested in the fact that they spun off the villain from a manga story . Afer seeing the few findable episodes of Zeiiai Karen Children I dont really see a relation between the shows or any need to see one before the other so no worries there. The shows have completely different feels to them. That little twist by itself would have gotten me watching. I'm a fan of a good anti hero. But the first few episodes have me strongly hooked. This is an AWESOME universe. You can just feel the room for so much growth and the fact that its drawing from this universe without sticking to a manga script, and doing it this well just leaves everything wide open. Even if the whole anime just tells the manga story (again haven't read the manga, not my thing) from a different perspective there should be tons to tell. If this doesn't hit your Que its because you accidentally clicked this instead of a show about middle school students and the crushes that don't love them during the final exam I suppose :). Great action anime with a good adult story line.